• Lead to soft, spongy floors. • Make hard floor surfaces crack (like tile). • Squeak as a result of floor movement. Oriented strand board is cheaper than plywood when used as roof decking, sheathing and subfloor. 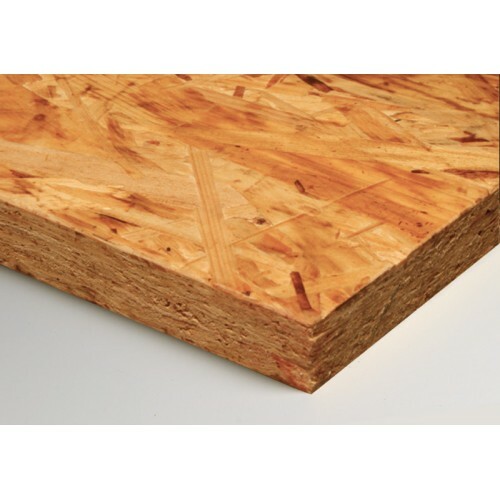 Both OSB and plywood are used for subfloors, walls and sheathing roofs. They work equally well when it comes to these uses, they are easy to drill into, plus they have an equivalent capability of holding nails. However, oriented strand board is considered to be less resistant to water (OSB swells in thickness when it is exposed to moisture), thus some people prefer using plywood for subfloors as well as roofs. Some builders find oriented strand board panels easier to use as they have pre-printed gridlines for facilitating measuring, marking, cutting plus fastening. Also, plywood manufacturers have introduced grid-marked sheathing; it’s advisable to use this because it speeds up installation. Oriented strand board panels are manufactured in lengths of up to 16ft (or sometimes even higher), whereas plywood is typically limited to 8-10ft. Therefore, oriented strand board is preferable for applications whereby wider or longer panels required. Note that some manufacturers of OSB use advanced technology in making high quality oriented strand board panels, which includes products that are more moisture-resistant. These are more expensive compared to traditional OSBs, but they may be worth the price because of their durability and performance. Oriented strand board can be made from trees with a small diameter like poplar that can be easily farmed, while plywood requires trees from old-growth forests, with a larger diameter. Moreover, oriented strand board releases more formaldehyde (a carcinogen that’s off-gased) compared to plywood. Oriented strand board is pushing plywood aside unceremoniously as the structural panel of choice. OSB is visually striking that people need a technical explanation regarding the material from builders. Today, oriented strand board has 70 to 75 per cent market share, while plywood has about 25 per cent share. Oriented strand board is in our future; the products of OSB will improve.